We think our list of handpicked and independently curated housewarming gifts is so good you’ll want to move house yourself. 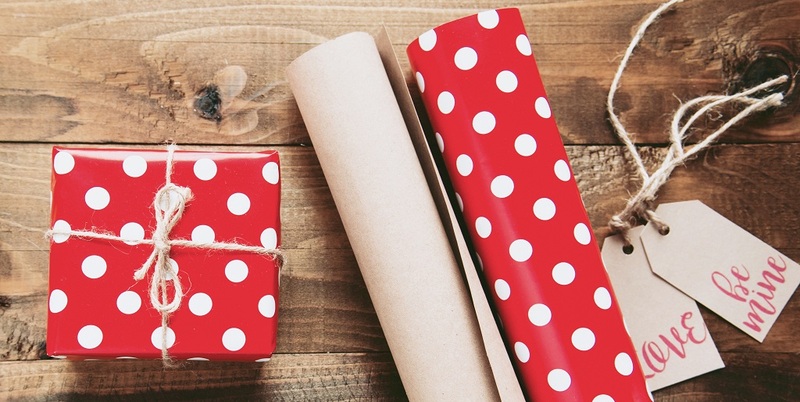 We’ve trawled the web and found what we think are the best housewarming gifts you can buy. From classy mirrors and clocks to personalised signs and dinner service sets, our list is comprehensive. All of the awesome housewarming gifts listed below have been chosen by the people behind Gifted Geek. This triple bevelled wall mirror makes the perfect housewarming gift for style-conscious friends or family. 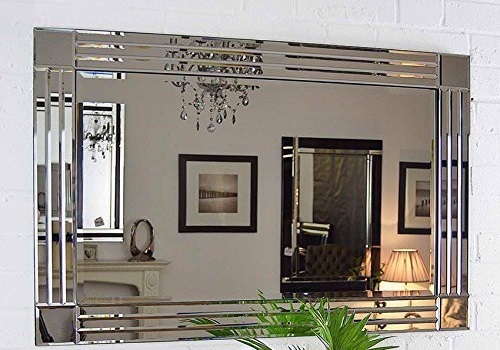 Featuring a classic, elegant design that will perfectly compliment both modern and traditional décor, this Venetian mirror can be hung in both landscape and portrait styles making it a great addition to the lounge, hallway, bathroom or bedroom. 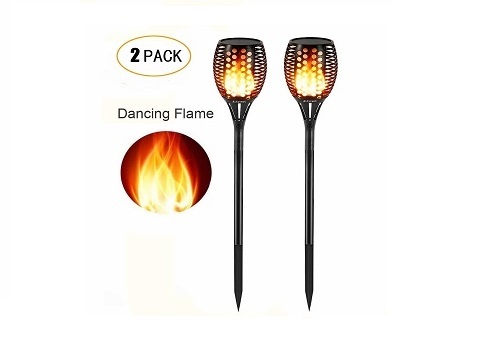 These solar garden lights feature a beautiful realistic dancing flame design, making them a stylish and romantic addition to any garden, and the perfect housewarming gift for fans of outside entertaining. Waterproof and highly durable, these solar garden lights contain 96 LED lights which give a beautiful realistic flame effect in a light that is easy to install with no wiring required. 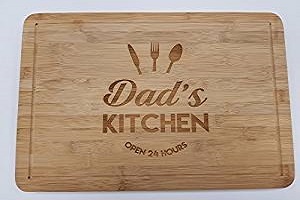 A thoughtful housewarming gift for the cooking enthusiast, this laser engraved chopping board is made from hard-wearing natural bamboo and measures 28 x 33 x 2 cm. Featuring high-quality laser engraving, and a natural finish that will not look out-of-place in any kitchen, the chopping board is a fun and quirky way to welcome budding chefs to their new home. 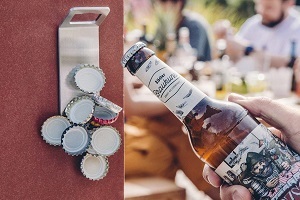 This clever wall mounted bottle opener not only opens your bottles, but its magnetic surface also catches and holds up to 20 bottle tops. This fun and practical housewarming gift features smart, simple styling and is easily mounted on any wall with no drilling required thanks to the supplied 3M tape. 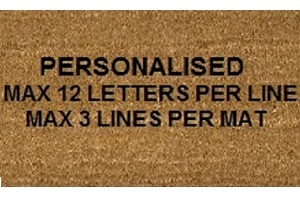 A fun and quirky housewarming gift, this classic coir doormat measures 60cm by 40cm and can be personalised with up to 3 lines of text with a maximum of 12 letters per line. The doormat is made in the UK and is PVC backed to prevent slipping, making it practical as well as fun. This water-resistant Bluetooth shower speaker is the perfect housewarming gift for wannabe singing stars everywhere. 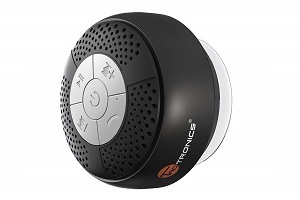 The wireless Bluetooth means that users can leave their phone or MP3 player in a safe location and enjoy singing along to their favourite hits in the shower. With an IPX4 water resistance rating, the speaker is splash proof and features a suction cup for easy mounting. This attractive shabby chic style apple crate can be personalised with up to two lines of text, making it a charming and thoughtful housewarming gift. 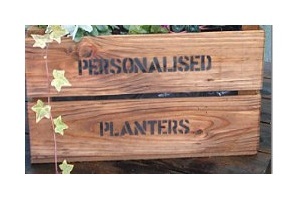 Measuring 56 x 36 x 27 cm this wooden crate looks equally attractive when used as a planter or as a rustic style storage container for the home or garden. 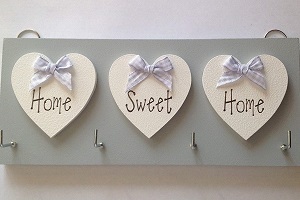 A classic and sentimental housewarming gift, this cute indoor sign features the message “Home Sweet Home” and can be personalised with the names of your friends and family. Measuring 20 x 10 cm, the sign is hand finished for a charming “shabby chic” distressed look and also comes complete with twine for hanging. This set of four rustic style natural slate coasters can be engraved with a message of your choice, making them a perfect option when looking for an individual and thoughtful housewarming gift. 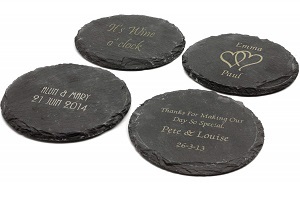 Each coaster, which measures 10 cm in diameter, is hand cut from high-quality natural slate and features padded feet to protect furniture against scratches. This set of four crystal wine glasses makes a stylish and classic housewarming gift that will be cherished and used for years to come by those who enjoy entertaining. 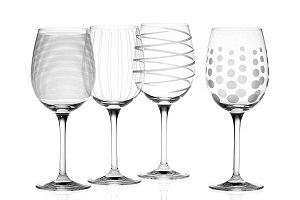 Beautifully gift boxed, and made of high-quality crystal glass; these wine glasses feature four different, yet coordinating, precision etched designs and are both stylish and practical. Plaques make great gifts for friends and this is one of our favourites. 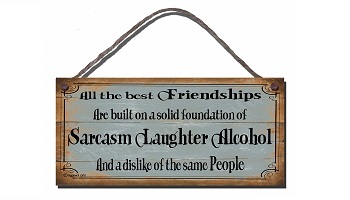 Make your friend giggle with this timeless humourous wooden plaque stamped with a statement that’ll make any visitor to the home belly laugh – All the best friendships are built on a solid foundation of sarcasm, laughter, alcohol and a dislike of the same people. 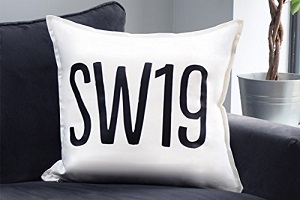 For a modern and unusual housewarming gift, choose this eye-catching personalised postcode cushion. Featuring a simple, striking design that will look good in any home, this 50 x 50cm cushion has a 100% cotton cover emblazoned with your chosen postcode in black vinyl and comes complete with a super soft, high-quality duck feather inner. 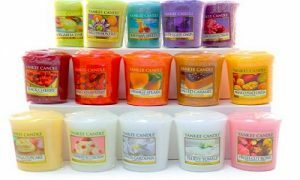 This sweet smelling Yankee Candle sampler set makes the ideal housewarming gift for candle lovers everywhere. Featuring fifteen Yankee Candle votive candles in a range of popular scents, these high-quality candles will each burn for up to fifteen hours, casting a warm, relaxing glow around the room while filling the home with fragrance. 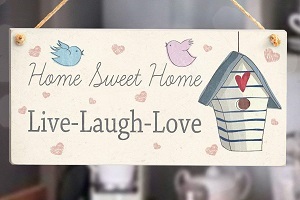 This cute “Home Sweet Home” Key holder makes a pretty and practical housewarming gift. The key holder features hearts and bows in a pretty shabby chic style and an attractive subtle grey colour that will look great in any home. The four hooks on the key holder provide the perfect place to hang keys ensuring that they are easy to find when needed. 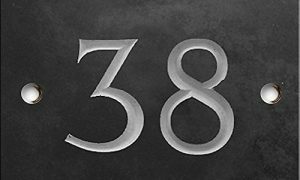 A stylish and practical addition to the front of any home, and a great housewarming gift, this engraved house number sign is made out of high-quality slate and is beautifully engraved with the house number of your choice. Featuring deep v-cut lettering and white highlighting, the sign is supplied with top of the range mirror screws for the finishing touch when attaching to the home. 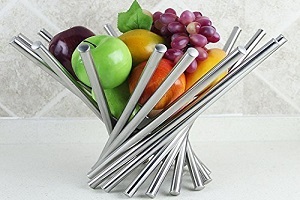 This unique, modern fruit bowl makes the ideal housewarming gift for fans of a contemporary-cool style. This statement bowl makes a great centrepiece for the kitchen, its generous dimensions of 40cm diameter holds lots of fruit and its open design allows air to circulate, keeping the fruit fresher for longer. When not in use the bowl neatly collapses for easy storage. This solar light windchime combines soothing sounds with a gently colour changing LED light to make the ultimate chilled out home accessory. 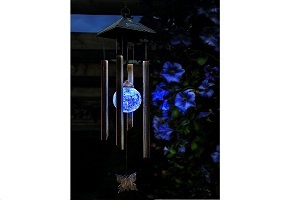 A perfect housewarming gift for fans of relaxation, yoga and hippie chic, this wind chime is suitable for outdoor use and is a great accessory to help turn the garden into a relaxing retreat. 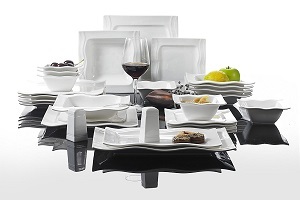 Fans of a cool, contemporary style will love this white porcelain dinner set. Its simple, square design in fine white porcelain will complement any modern kitchen, making it a lovely housewarming gift. The contemporary styling of the dinner set lends itself equally well to fine dining or family dinners, making it a gift that will be used and cherished for years to come. 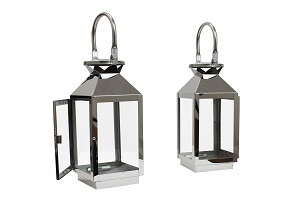 This pair of stainless steel candlelight lanterns mix traditional styling with a sleek, modern stainless steel finish, making them a gift that will suit any property style from rural to urban. Suitable for both indoor and outdoor use, the lanterns can be used outside to light up a family barbecue or create a relaxing, romantic ambience within the home. What could make a more perfect housewarming gift than the prospect of never having to hoover again? 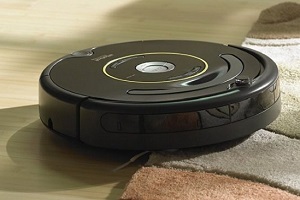 Give your loved ones the gift of more free time by getting this iRobot Roomba 605 vacuum cleaner to do the hard work for them. This easy to use robotic vacuum cleaner cleans your floors at the touch of a button and automatically recharges itself between uses. For the gadget-loving gardening enthusiast, this robotic lawn mower will make the perfect housewarming gift. 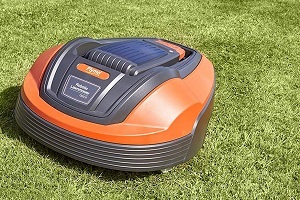 The Flymo 1200R Lithium-Ion Robotic Lawn Mower comes supplied with everything you need to get started so, once set up, you can sit back and relax while it does the hard work for you, cutting your grass and then taking itself back to its charging station when finished. Wine and alcohol-themed gifts are popular and make great stocking fillers. So here is another one sure to bring a smile to your recipients face. 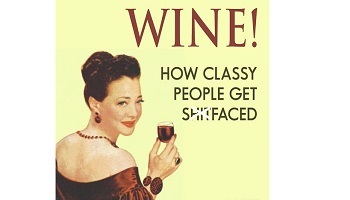 These quality coasters are printed with the words “Wine – how classy people get sh*tfaced”. Get straight to the point with this humourous gift. 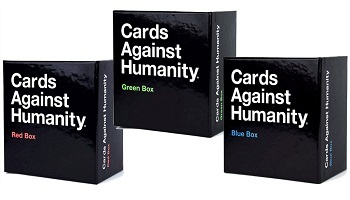 Cards Against Humanity is the original politically incorrect card game. Stick two fingers up to the snowflake generation with this crude, hilarious and addictive game. You can even expand it with multiple expansion card packs for years of fun. 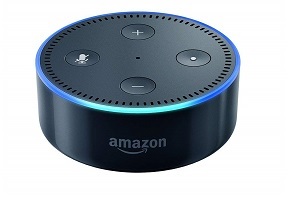 A perfect housewarming gift for gadget fans, the Amazon Echo Dot uses Alexa to help you with a range of tasks including playing music, controlling smart home devices, setting reminders and alarms and much more. This small, compact device can fit unobtrusively into any room in the house and will always be on hand to answer your questions, simply say “Alexa” to wake it up. The ideal housewarming gift for birdwatchers and nature enthusiasts, this decorative bird feeder will help to bring plenty of feathered visitors into your loved one’s new garden. 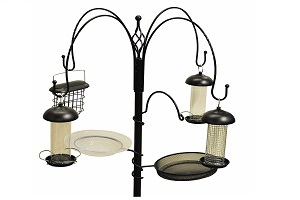 Featuring four feeders, a birdbath and a feeder tray, this bird feeding station is made of high quality, heavy duty metal and stands approximately 185cm above the ground. 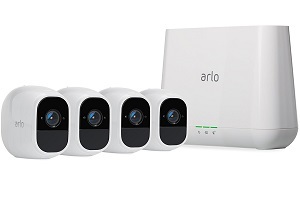 Give your loved ones the gift of extra safety and security in their new home with this Arlo Pro 2-2 Camera Security System with Inbuilt Alarm Siren. With a range of hi-tech features including 1080p HD images, night vision, free cloud recordings and compatibility with Amazon Alexa, the camera will help to provide extra security and peace of mind. The team here at Gifted Geek really enjoyed sourcing these housewarming gift ideas. With so many presents to choose from, we don’t think you’ll have any problems making your friends, family members and colleagues smile. If you have a suggestion, perhaps an awesome housewarming gift that we’ve missed from our list, contact us here.